Essilor’s inclusive business, 2.5 New Vision Generation (2.5 NVG),​ hosted its first ever Mitra Mata Convention in Indonesia which saw over 700 Mitra Mata come together to share best practices and to celebrate their achievements. To improve the quality of primary vision care in Indonesia, Essilor’s inclusive business 2.5 New Vision Generation (2.5 NVG), created the Mitra Mata program to organize and strengthen the existing primary eye care industry. The program aims to raise awareness about the importance of eye care, provide access to quality affordable vision care in rural Indonesia and offer the opportunity for existing self-trained primary eye care providers to further professionalize their services. The first Mitra Mata Convention took place in Medan, the capital of Indonesia’s North Sumatra province, ​and the level of energy, motivation and excitement was incredible. Essilor CEO, Hubert Sagnieres, and Essilor Chief Mission Officer, Jayanth Bhuvaraghan, officially opened the convention by banging a gong to welcome everyone. Individual Mitra Mata shared their inspiring stories and 2.5 NVG representatives from China and India provided useful information and insights on their local programmes such as Vision Ambassador and Eye Mitra. Guests were entertained by stunning local folk dances and musical performers which saw the 700 Mitra Mata and other guests dancing in the aisles and on the stage – a fitting end to a fantastic celebratory day. 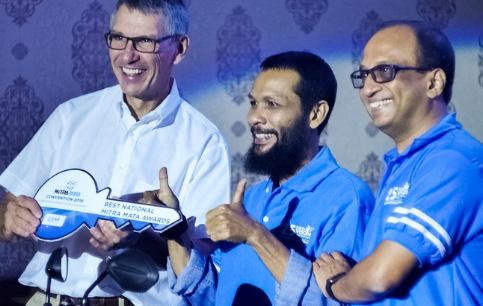 This was a great moment for Essilor’s inclusive business 2.5 New Vision Generation as it shows how the Group managed to adapt its programmes to the local market and scale them up successfully. By professionalizing the existing infrastructure, we will create a taskforce of skilled micro-entrepreneurs that will help us to eradicate poor vision in Indonesia within the next 30 years. 2.5 NVG supports the cost of the training and helps Mitra Mata Opticians to set up their stores with specialist business training, merchandising and marketing materials. By the end of 2018 there will be 1,200 Mitra Mata providing quality affordable vision care in Indonesia. 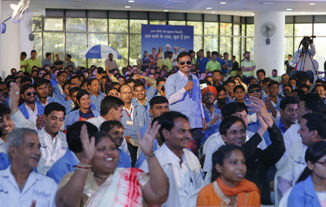 A thousand faces of vision care: Essilor’s annual Eye Mitra convention celebrates the program developing skills, creating jobs and uplifting lives by tackling poor vision in India. An event that brings together Essilor’s growing community of passionate vision care entrepreneurs to share experiences and learn from each other’s successes and challenges.